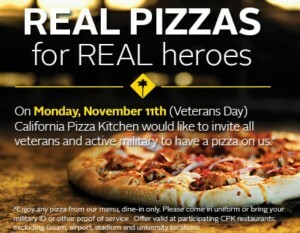 Free Pizza @ CPK For Veterans- 11/11!! Stop by your local California Pizza Kitchen on 11/11/13 either in uniform, with your Military I.D. or other proof of service to have a FREE pizza on the house! I wish to express my aepipcration to the writer for bailing me out of this type of situation. Just after looking out throughout the the net and finding suggestions which are not helpful, I figured my life was done. Existing without the answers to the difficulties you’ve solved all through your main blog post online sexshop is a serious case, as well as ones that could have negatively damaged my entire career if I had not encountered your web page. Your own personal expertise and kindness in touching all things was excellent. I don’t know what I would have done if I hadn’t come across such a stuff like this. It’s possible to at this moment look forward to my future. Thanks a lot very much for this skilled and amazing help. I won’t hesitate to recommend your web page to anyone who would like care on this topic.